Home Columnists Have You Become Your Teenager’s Drug Dealer? Have You Become Your Teenager’s Drug Dealer? Are your kids partying too hard? 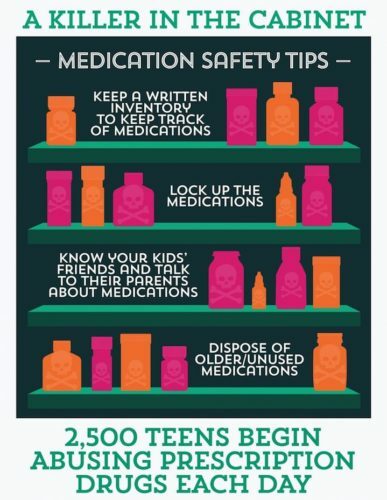 The family medicine cabinet offers direct access to the most commonly abused drugs by today’s teenagers. Teens are abusing prescription painkillers in increasing numbers. In addition, they are mixing them with other drugs, alcohol and/or crushing them to snort or inject for their euphoria-producing effects, compounding the already dangerous risk to be a deadly one. Pain medications like OxyContin, Percocet and Vicodin, relieve severe or chronic pain, and are highly regulated and obtainable only by written prescription from a medical doctor to be used “only as directed.” These are “controlled substances,” and yet most parents keep them unsecured and easily accessible. Teens—and some parents too—have a misconception that prescription painkillers are safe because they can be legally obtained when prescribed for legitimate use by a doctor. Surveys show that almost 50 percent of teens believe that taking prescription drugs is much safer than using illegal street drugs. With the increase in availability and diversity of product, today’s teens have access to prescription drug by simply opening their family or friend’s medicine cabinet and trying what’s inside—a practice known as “pharming.” Teens also experiment at “pharm parties” where they bring pills from home, pour them into a punch bowl, and take turns reaching in and popping a handful—often adding alcohol. Dealers are also targeting the market with pills selling for 10 times the original price. There is no time like the present to start the conversation. Let your teen know about the dangers of abusing prescription painkillers. If you don’t know what they are, then educate yourself. Look for the signs of use, and don’t hesitate to ask for help. With awareness, education, communication and reducing access to prescription painkillers in your own home, parents can help beat this growing problem.